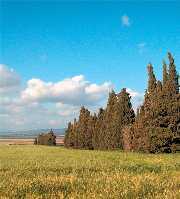 Throughout the ages the Galilee has been a land where people have felt close to God. The beauty of mountain and forest, the open spaces, and the clear air have all contributed to the crystallization of profound insights. The great Jewish healers of the Talmud lived in these mountain villages. Jesus knew these hills well. The Druze practice their secret rites here. Kabbala and other aspects of Jewish mysticism developed in the Galilee and still flourish in its schools and yeshivas. Our "Land of Miracles" tour will give you a glimpse of all these - a look into the search for meaning..
Seminar and walking tour of Safed, the town of the kabbalists. Learn about Kabbala, visit synagogues, participate in sessions with mystics and their students. Tour the Biriya Forest and visit the grave of Yonatan ben Uziel, deep in the forest, which attracts thousands of pilgrims annually. Take a night tour of the old cemetery of Safed, where many of the founders of mysticism are buried.